It is normal that the cutting process as well as folding processes may be off to a maximum of 1 mm. This is industrywide and not specific to Printing Peach. This is the reason that bleed and text safety are included in the print files. Bleed and text saftey in essence, allow the cutting and folding processes, to a small degree, to fail very gracefully. 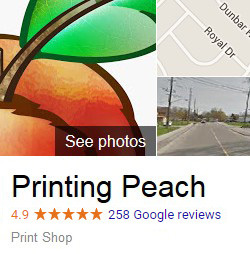 Printing Peach does not guarantee against issues based on files that have not been properly prepared by the client to anticipate these limitations. There are a number of very good reasons why we cannot guarantee 100% color accuracy. We recommend you read more about this potential issue and how you can best ensure your satisfaction here. Our money back guarantee covers the full cost of the print product, but does not cover the cost of shipping. Reprints will usually be done without having the product shipped back, however in the case ofa refund, the product must be shipped back to us. Our graphic design guarantee is very simple: If through the revision process were not able to create your design to your satisfaction, we will refund any deposit or payments made up until that point.